South African prototypes, projects, concepts, etc. Re: South African prototypes, projects, concepts, etc. I used to have a Brassey's book that had a quite detailed entry on the TTD. Haven't got it now which is a shame. I can't remember exactly what the basis for the chassis was but I don't think it was a Leopard 2. IIRC it was Centurion, wasn't it? Pause the TTD vid at 14 sec. 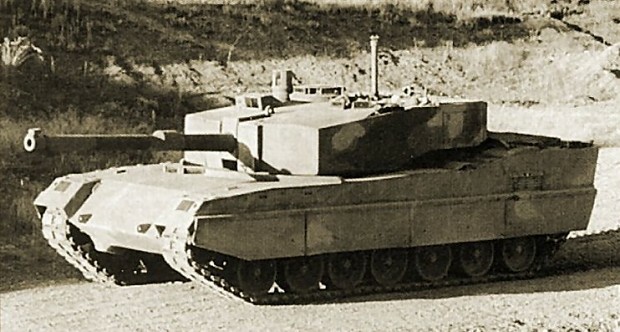 That's a LEO2 hull all day long. Looks like they added some extra dust filtering on top of the engine bay. It wouldn't be the first armoured vehicle hull loaned to SA for testing and then sent back to Germany. The Olifant Mk1B, Optimal, and Mk2 are Centurion based. The TTD was a brand new design. The TTD hull is not a Leopard 2 hull. The question being asked is whether the hull in the video posted earlier, the developmental sub-component hull used to validate various components before the TTD was built, is a Leopard 2 hull. I am not totally convinced, the engine output as stated in the video is different, as is the rear hull and engine cooling systems placement, just from a brief glance. Bad Behavior has blocked 3656 access attempts in the last 7 days.